Getting to work at 5:30 a.m. after weeks of planning and coordination with outside sources might sound like a company getting ready for Black Friday, but here at WPI, it’s actually preparation for move-in day for the 2017-18 school year. The eight staff members of the Office of Residential Services, including director Casey Wall, as well as 51 resident advisors (RAs) and two graduate housing assistants, are right in the middle of move-in preparations that are weeks, even months, in the making. Although the official move-in day for first-year students isn’t until Sunday, Aug. 20, which Wall refers to as “the big show,” the office is having no trouble keeping busy in the meantime—beginning with students who moved in this past Saturday as part of the Connections program, they’ll be organizing a move-in process of some kind every day until classes start. Wall and the rest of the residential services staff hope that their efforts will provide students with a welcoming, supportive environment that’s conducive to learning and serves as an exceptional home away from home, and that all starts with the experience they have during their first days on campus. From fraternities, sororities, and members of the ROTC program working together to move first-year students into their residence halls to campus police, community advisors, student activities, and academic advising staff members providing support and being available to answer questions, the community works hard to ensure that their first day as official WPI students is as warm and welcoming as possible. Students inspect a room before move-in day. Wall has only been in her current position for about a year and a half, but she’s no stranger to the fast-paced nature of college move-in days. When asked what her favorite part of the day is, Wall is quick to answer. 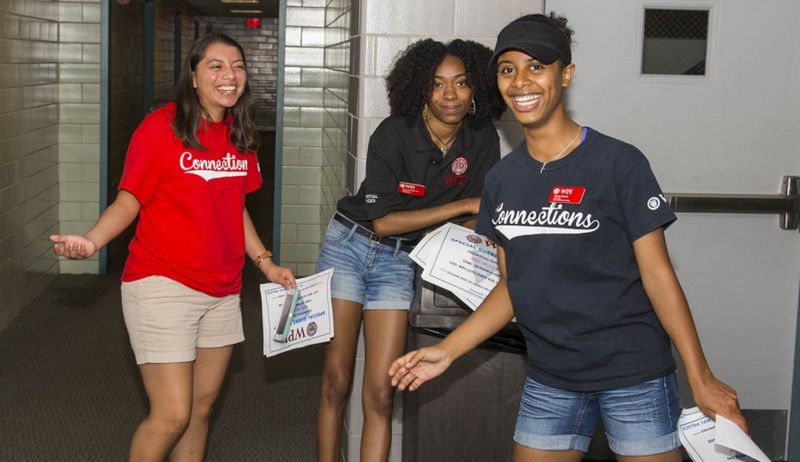 “I think my favorite part is stepping back and watching the RAs interact with the residents, and families interact with their students,” she says, explaining that seeing how all the preparation and teamwork that went into having the residence halls ready is worth all the hard work leading up to the day. “It’s the whole point of why we get here at 5:30 in the morning that day, why we do all this prep work and have everything ready, so that when those students arrive, it’s the best possible experience.